CRM Mail Filing Automation is perhaps one of the most useful extensions to Sage CRM you can implement. Filing email is a pain. You have to manually file each email, and it can be difficult to remember to do so, and time consuming also, especially if you get a lot of emails! 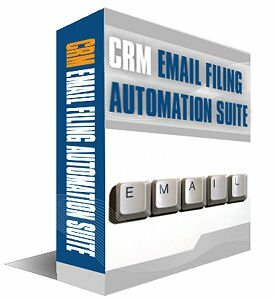 CRM Mail Filing automation takes all of the work out of filing emails - it makes it automatic. With this handy extension installed all of your inbound and outbound email from Microsoft Outlook is automatically filed into CRM, for relevant contacts *. Our mail filing automation is composed of 2 parts: inbound filer, outbound filer. • Inbound filer is a server-side component that installs into your Microsoft Exchange server, and automatically files appropriate inbound emails - even before you read them! • Outbound filer is a client side component that is installed into Microsoft Outlook. The outbound component determines if an email should be filed and ensures it gets to CRM correctly, all automatically! We are happy to set up a time to do an online demo with any interested buyer.